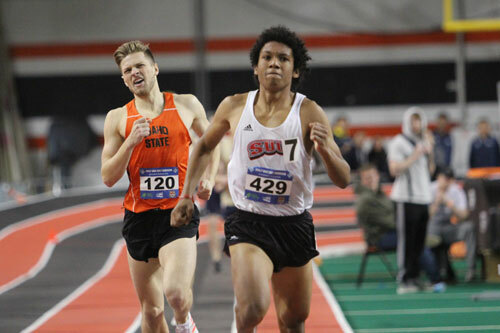 Competition wrapped up at the 2017 Big Sky Conference Indoor Championships on Saturday afternoon, with the SUU men’s team finishing second in the field and the women finishing 11th. SUU’s Kasey Knevelbaard started the day off on the right foot, claiming the Big Sky Championship in the men’s mile. He ran a 4:06.25. Knevelbaard finished first, and Josh Collins finished in third place to rack up several points for the Thunderbirds. George Espino claimed his individual Big Sky Championship in the 800-meter, with a new school record time of 1:48.83 (converted). Knevelbaard finished third in that event. At the conclusion of the meet, Espino was named Men’s Outstanding Performer by the Big Sky Conference. Thunderbird hurdler Devon Montgomery set a brand new school record in the 60-meter hurdles, finishing in a time of 8.05 and finishing second overall at the event. Montgomery went on to say that he thinks the team will be able to come out with a different fire once this meet rolls around in the outdoor season. Not to be outdone, the women’s 4x400 relay team set a new school record as well. They finished the second heat of the event with a 3:47.10. This surpassed the previous mark of 3:47.53, which was set in 2015. The group of four girls was Mia Russell, Carly Dalton, Peyton Green and Linnea Saltz. SUU’s men’s 4x400 team finished seventh to get on the scoreboard. Freshman Tre James was awarded the silver medal in the men’s 60-meter dash, earning All-Conference status. Brandan Harley also earned All-Conference honors in the 400-meter dash, finishing in third. In the women’s mile SUU’s Sharlie Dimick earned All-Conference status by finishing third with a converted 4:47.67. Senior Josie Riggs also scored points in the event by finishing seventh. In the men’s 3,000-meter Matt Wright, Knevelbaard and Collins finished fourth, fifth and sixth respectively to score for the Thunderbirds. In the women’s 3,000-meter Dimick ran a converted 9:44.41, which puts her fifth all-time for Southern Utah. Saltz finished fourth in the women’s 400-meter, with a converted time of 55.67 also put her fifth all time for the T-Birds. As a team the Thunderbird men finished with 100 points, which was 29.5 off of the Conference Championship. Southern Utah and Northern Arizona were neck and neck for the majority of the meet, but NAU used a strong 3,000-meter performance to pull away. The women’s team finished in 12th with 28.5 points, which was a big improvement from the same meet last season. The Lumberjacks also won the meet on the women’s side.